Imagine having such a tool available within productivity tools, content systems, media players and browsers to generate this type of visualization in an on-demand manner to better highlight patterns and themes (in this case, speeches). 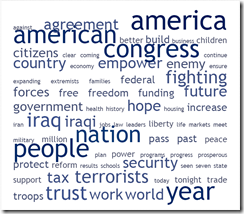 Last year’s 2007 State of the Union Tag Cloud was such a hit, I decided to follow up again this year. 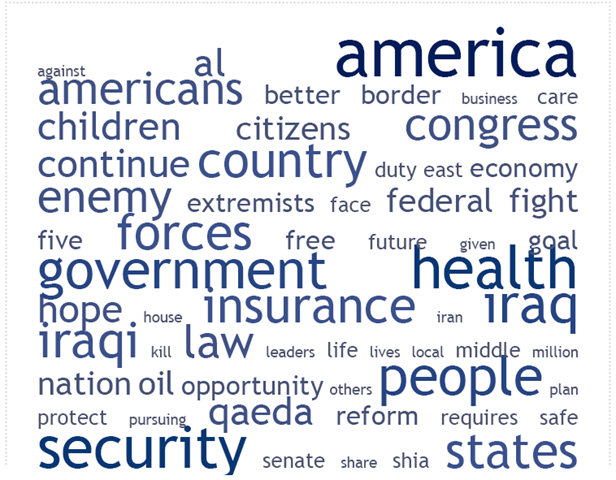 A few major differences: Congress is mentioned a lot more this year, while health and oil don’t show up at all. This year’s address looks more active…instead of “fight” we get “fighting”. 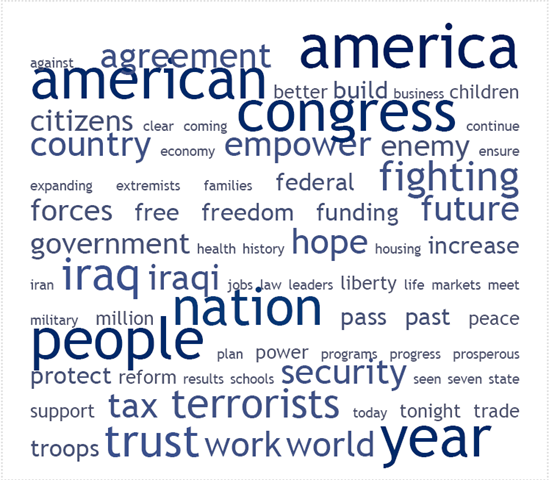 Overall, the themes are still easily picked out: “terrorists” still play a major part in the speech, and we get “empower” and “hope” and “trust” as themes. Delver is a socially connected search company; a next-generation web search engine - what we call a Connected Search Engine - that improves the relevancy of web search results by prioritizing these results based upon the searcher’s social network. Delver uncovers the wealth of knowledge from users’ online connections in a useful and enjoyable way. We co-founded Delver because we recognized a strong need for people to find information created or referenced by their friends and friends-of-friends. Delver supports a spirit of open interchange where the wisdom of a person’s social network can contribute to that individual’s search success. Existing search engines do not account for who a person is and what that person’s network finds valuable. Delver makes search more significant to the user by organizing friends’ tags and information found on social networking profiles, blogs, bookmarks, photo and video sharing sites rather than basing results upon the popularity of a given page or Web site. Pundits for new, enterprise-oriented social bookmarking and tagging systems claim they can provide what knowledge management systems haven't: easy and secure storage, retrieval, and sharing of valuable documentation within an organization and around the Internet. By enabling users to "tag" documents and then track them across user bases, enterprise bookmarking systems can promote or demote a document based on its popularity. Think Delicious (http://del.icio.us) inside your firewall. In fact, the process isn't all that different from a traditional bookmarking service. As users visit pages, they fill out a form for their bookmark by entering the URL, a brief description (the tag), status of the page (private or not) and other information. The data from the form is stored in a central database. Users can then retrieve their bookmarks or those of others, assuming privacy and security restrictions allow it. But for organizations, and particularly hierarchical ones, the wisdom of the crowds—or "folksonomies"—­suggests a knowledge management system gone mad. For years, IT departments have spent hundreds of thousands of dollars carefully cultivating infrastructure and taxonomies to classify documents across the enterprise. While these taxonomies might have been static at times, at least they provided consistency. Given enough active users, folksonomies can be self-correcting. But organizational hierarchies and complex, first-generation Enterprise 2.0 software make it hard to attain sufficient involvement within the enterprise. The immaturity of many Enterprise 2.0 products doesn't help, either. Basic security and privacy requirements may not be met, and user interaction needs to be better conceived. Costs can also mount quickly. Nevertheless, IT cannot ignore the emerging area of enterprise social bookmarking. Unlike the much-touted but failed groupware of the 1990s, enterprise bookmarking systems leverage two well-tested usability factors: Users want to recall valuable documents, and tagging is a growing means of doing so. According to the Pew Internet & American Life Project, 28 percent of Internet users tag documents, including 7 percent daily. These figures will only climb as Generation Y moves into the workplace. Collaborative tagging systems are powerful tools for organizing, browsing and publicly sharing personal collections of resources on the World Wide Web. They have enjoyed widespread adoption by end-users. Collaborative tagging produces aggregations of user metadata, often referred to as folksonomies. These user-generated classifications emerge through bottom-up consensus by users assigning free form keywords to online resources for personal or social benefit. Del.icio.us, Flickr, 43things, Furl and Technorati are examples of web-based collaborative systems for building shared databases of items. 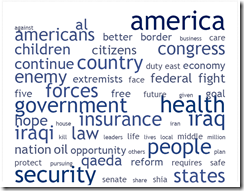 The users of these systems create a flat metadata vocabulary that can be used to perform metadata driven queries, to monitor change in areas of interest or to discover emergent trends, such as the hottest/most popular topics in the system. In the past, folksonomies have often been seen as orthogonal to taxonomies and controlled vocabularies: the latter being rigid, hierarchical and organically hand-crafted by professionals a priori; the former being flat, inclusive and emerging from bottom-up users' input and consensus . Session Notes - good session, wealth of information. Every person is an expert in their own vocabulary. People are their own experts. Findability / re-findability is key point. People put their own hooks into their tags. Improved understanding of customers by understanding their vocabulary around your pages, objects, etc. Disambiguation - tags can point to references that help with "meaning"
A short summary of how Honeywell is using a tagging/social bookmark platform from ConnectBeam. Other options for tagging and social bookmark systems that will be available later this year include: BEA Pathways and Lotus Connections. Cogenz and Jive Software as well as the Scuttle open source project are other options. There is also a tagging and social bookmark add-on for Microsoft Windows SharePoint available from WSSsearch. One important aspect that is worth calling out is the integration between tagging and social bookmark systems and enterprise search (in this case, Honeywell is taking advantage of Connectbeam's integration with Google's enterprise search solution). This example reinforces a point I've made multiple times that tagging and search trends are very synergistic and are not in conflict with each other. The social networking and community-building aspects are also something important to consider when considering these types of social software solutions. The key to social search in an enterprise context is identifying and connecting each enterprise worker with colleagues whose interests and knowledge enhances their own. Privately held Connectbeam, located in California's Silicon Valley, has mastered this. Its Social Bookmarking & Networking Appliance, a pre-configured appliance server deployed behind the enterprise firewall, highlight information from colleagues' searches, especially the information that they have found most useful. So it is very fitting that Connectbeam was chosen this month by global technology company Honeywell to provide social bookmarking and tagging, expertise location, and enterprise social networking capabilities to Honeywell employees. Using Connectbeam software – not only its Social Bookmarking & Networking Appliance but also its Application Connector for Google Enterprise Search – Honeywell knowledge workers will be able to locate and manage information together while easily networking with each other's knowledge, interests and skills in a secure, behind the firewall implementation. Marc Stein is the co-founder of tag2find. They are based in Linz, Upper Austria. Marc studied Software Engineering for Medicine in Hagenberg. Tagging is a much more simple way of organizing your data compared to traditional hierarchical folder systems. In that, you will never need to restructure your desktop organization if your priorities change or if company structures change. A tagged file is always at the right spot as its “position” is defined by its content and the tags used and not by being put in a certain folder. And by avoiding troubles, I am referring to finding old files can be an adventure, especially if other users are involved. In hierarchical systems, you have to know the specific structure of the desktop to efficiently search files. In a tagging environment, you do not have to think about structures. And your colleagues will love you for that. A very complete presentation by one of the thought-leaders in the field of tagging. Definitely worth clicking through the SlideShare screens or downloading the PDF to gain a overview understanding of the social aspects of tagging. Today's presentation at the O'Reilly Web 2.0 Expo seemed to go very well. My session was Tagging That Works had really good feedback, which I thought was good as I really did not know the audience coming in to the presentation. Taxonomy fails when the design does not reflect the use. Richardson looks at the issue that taxonomies are often designed by subject matter experts, while the people using them are not. Unless the SME's impart a lot of their knowledge about the subject to the users, the users are going to use different terms in their attempts to find and categorize content. Frustration ensues. Taxonomy fails because it's too easy to get too complex (and rigid) with a taxonomy. And the supporting technology (search) places too much emphasis on creating specific metadata in your information management system. I hadn't heard this second argument, though I have experienced it in various settings. Either the search tools completely ignored the fact of how something was tagged with metadata. Or that metadata swamped out all other results. Richardson uses a nice example to walk through how it happens. That said, this seems like something that should be manageable with the search algorithms that are available today. Below is an interesting snippet from ZDNet. It's difficult to know where to start -- is the Autonomy position that del.icio.us and Flickr don't work? Perhaps someone should send Mr. Lynch a copy of the book Ambient Findability or setup a conversation with Thomas Vander Wal on the value of tagging. I do not find clients saying that they are going to abandon search and taxonomy tools. Most customers and other industry experts I talk to are looking at tagging, social bookmarks, tag clouds and folksonomies as solutions that compliment and add value to their information architecture efforts. It is obvious that people will tag for a variety of reasons (both good and bad) and also does not take much insight to note the problems associated with tagging. And yet consumers and companies like IBM (and others I cannot mention due to confidentiality reasons), have found significant value in these tools. IBM has been involved in several webinars in the past discussing the feedback loop folksonomies create that benefits those involved in corporate taxonomy efforts. This does not diminish the need for tools provided by vendors such as Autonomy - the solutions are synergistic and not exclusionary. Andrew McAfee, Associate Professor, Harvard Business School has also documented an example of where a tagging solution can improve findability. What Autonomy should do is not complain about the evils of tagging but actually deliver a tagging companion product that is integrated with its traditional search and taxonomy tools. While up on stage, the message could be much more persuasive and influential - positioning Autonomy as a vendor working to advance the broader issues around "findability". That would show some market innovation rather than giving the appearance of protecting a status-quo business model that perhaps is not keeping up with the times. During a presentation, Mr Lynch slammed the popular practice of tagging web content and says that it won't help to organize information. Mr Lynch quoted an essay by Cory Doctorow, the science fiction writer, titled Metacrap. "Tags don't work because people lie, they are lazy, and they use different tags. And there is a huge amount of information that will never be tagged." One of my active research areas right now involves event stream processing and its implications to communication, collaboration and social networking. Specifically, I'm looking at how attention data and "post" activities act as informal, loosely-coupled signaling methods that, when streamed in a public manner, can be combined with sensor/filter/relay mechanisms to intelligently pull messages and information to other people or situate the information to the right place (e.g., a "my space" created as a honey pot of sorts to house interesting/relevant items). A goal of such an environment would be to create opportunities for subsequent connection and interaction (at a person-to-person, group, team, or community level). Examples of attention data and post events would include blog entries, tags, social bookmarks, and changes to presence indicators - even Twitter messages are a continuous stream of post events. The collection and streaming aspects could be accomplished through a combination of pinging, aggregation and XML syndication services. The sensor/filter/relay mechanisms could be instantiated through various clients and agent/watchers. This type of environment would likely not be a single system (overly complex and monolithic) but instead would be some set of inter-connected / net-centric systems of interoperating nodes, without hierarchy, and include some level of trust zones (for security/identity reasons). Why look into this? Years ago I became fascinated by what DISA and DoD were doing around net-centric collaboration. The DoD felt that it was imperative to move from Task, Process, Exploit, Disseminate (TPED) to Task, Post, Process, Use (TPPU). The design emphasis is on posting, processing and using data and information in parallel. A key aspect was enabling processing to happen in parallel to information access with people having access to information refinement along the way. The thinking (I believe) is that getting information out to those that have a "right to know" through an intelligent pull model is more effective than pushing information through a process first (introducing latency) that makes assumptions about who "needs to know" (often driven by a desire for risk avoidance). A TPPU model is about managing risk while providing near-instantaneous communication and information access. It avoids scenarios where people are not alerted and failed to become knowledgeable about situations that impact them. It is almost impossible to know who might have a time-sensitive or other relevant interest in the raw data and its refinement as the process cycle continues. It was felt that a TPPU approach would reduce communication latency and improve information transparency. The result of such an environment would be improved shared situational awareness and self-synchronization through net-centric collaboration. This would have obvious operational and battlefield benefits and have a transformational impact on future warfare strategies. Adopting and applying these concepts more broadly is intriguing. Almost all organizations could benefit from a TPPU-like model in terms of improved enterprise agility, resiliency, and performance - and would positively influence innovation and knowledge management efforts). This, in a round-about way, gets back to "the need to know" vs. "the right to know". It does not necessarily mean an end to push-centric systems, they continue along in parallel to intelligent pull models. Clarifying my thinking around the balance between the two models was triggered by a comment from Urban Mermaid below. It's a fair point and highlighted some incomplete "thinking out loud" on my part in an earlier blog entry. In any case, this post provides a glimpse into some current research activities. Feel free to comment ... this is not fully-baked in my mind, I'm bouncing ideas off of various clients and vendors and found this post by Jeff Jonas especially helpful. interesting that you mention people wading through the stream of information and extracting what they want. however, what i've found in my job of providing research & analysis is that i still have to actively push information to people. it's like the advertising mandate to break through the clutter. sure, there's definitely people willing to wade through it and that's a cultural value that's beginning to embed itself, but i also feel there's still a need to have some information that gets fed to people.